The cuckoo is a brood parasite, which means it lays its eggs in the nests of other birds, thus forcing the unwitting "foster parents" to hatch and raise the cuckoo's chicks. In Britain and parts of Europe, reed warblers have been singled out by the common cuckoo (Cuculus canorus) as foster parents for such a long time that both birds have evolved to find different methods of outsmarting each other. 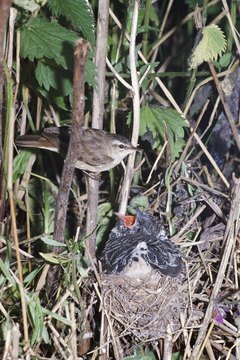 Reed warblers are extremely protective of their nests. They use threatening movements and swoop and attack any cuckoos that get too close. This is called "mobbing," and scientists have observed that warblers with well-concealed nests are less likely to draw attention to themselves with this behavior than those in exposed locations. Cuckoos spend countless hours "spying" on warblers as they build their nests. Reed warblers usually build their nests in close proximity to others, and the female cuckoo is able to single out the careless parents. She waits until they are away from the nest. Then she swoops down, pushes an egg out of the nest and lays her own egg. She has to be quick, and this process only takes 10 seconds. In the past, reed warblers could identify cuckoo eggs and tossed them out of the nest. However, the cuckoos evolved to lay eggs similar in color and appearance to those of the warbler. A female cuckoos lays a single egg and can even incubate it internally for 24 hours before laying it, giving the cuckoo's offspring an advantage when it hatches in a nest with warbler chicks. Warblers can't tell the difference between their own offspring and cuckoos. The cuckoo chick is stronger and bigger than the warbler chicks and forces them out of the nest. The cuckoo chick soon grows much bigger than its foster parents and the warblers have to work hard gathering enough food to keep it satisfied.